In the same room as Bertie Ahern and Tony Blair heralded the progress in the Peace Process, Comahtas made history in accepting an invitation to bring their Irish Concert Tour Macalla na hÉireann to Stormont on the 18th October, 2007. Over 200 people from diverse backgrounds were invited to experience the ground breaking and historical event which again underlined the unifying nature of our shared cultural heritage. Here we had an echo of the 1792 Belfast Harp Festival, a historically and musically significant event, which was organised by a group of Belfast people motivated to preserve the already endangered harp and harp music tradition. Edward Bunting, a nineteen year old church organist, was employed to notate the music played by ten Irish harpers and one Welsh harper at the Belfast Assembly Rooms Belfast Exchange. The Irish language scholar engaged to transcribe the words of the songs failed to attend. These harpers were required to play Irish music only. Bunting’s first collection of material sourced at the festival, A General Collection of the Ancient Irish Music (1796) contained informative notes as well as music. A second volume containing English language lyrics was published in 1809 followed by Bunting’s third and final collection in 1840, The Ancient Music of Ireland, the latter containing airs from other collectors. 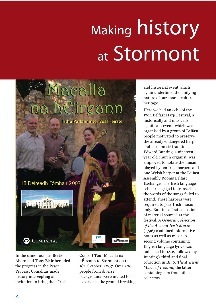 Macalla na hÉireann included a commemorative concert-item to mark the 400th anniversary of Imeacht na nIarlaí, The Flight of the Earlsin 1607. The Flight of Ulster Chieftains including O’Neill and O’Donnell from their home territory, following the Nine Years War and Treaty of Mellifont in 1603, marked to a large extent the end of what has been historically referred to as ‘Gaelic Ireland’. The demise of other Gaelic Clans, such as the O’Sullivans of the Beara Peninsula in Cork, was also in evidence by this time. The show was produced by Siobhán Ní Chonaráin. In addition to Stormont, the other venues were Dublin, Randalstown, Castleblayney, Belturbet, Coalisland, Omagh, Skibbereen, Ennis, Templeglantine, Cashel, Birr, Athenry and Navan. Venues wishing to host a venue for Macalla na hÉireann 2008 should contact Bernard O’Sullivan 01 – 2800295 or enquiries@comhaltas.com.